Like last year, instead of choosing my favorite polishes (because there were a lot!) and singling out brands, I like to focus on looking back at my nail art of the year. I tried to get it down to 17 and I was pretty close! Or not. But cheers to my last post of 2017. I hope you had an excellent year! So this year, I started a new series on my blog, Pusheens! Each month, I was inspired by the calendar and took that image and put it on my nails. It was fun creating different landscapes and Pusheen characters. It was really fun for me to look through all my posts, so I figured you would enjoy it! I linked every post, so if you want to check them out more, you can! Seriously, it's the end of another year. I don't know about your traditions, but I always pop some champagne or Lambrusco during NYE. I'm actually not a big NYE fan but I love to toast the night with bubbly. So I had to do a manicure with champagne! This is actually my last nail post of 2017! I'll have two more posts with round-ups! Hi all! I thought I would do a little something different and share some of the Holiday Window Displays in NYC. 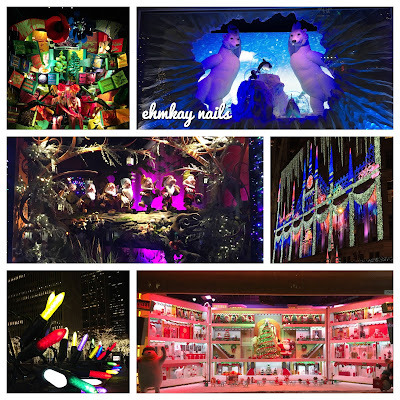 If you didn't know, major department stores go all out during the holidays and create intricate, themed displays. I checked out Saks Fifth Avenue and Bergdorf Goodman before Christmas and Macy's and Lord and Taylor after Christmas. I'm here today with the Fireworks prompt! A little late, but oh well! I chose a city-inspired fireworks scene! It's fun to see fireworks against the high rises when you're across the river in new Jersey (my home state!). In NYC, you sort of just seek peeks of fireworks here and there! Haha. But it's louder and fun to be IN the city. So that's what I did! Hi all! I wanted to get this prompt done on time and I'll show you the fireworks look tomorrow! I actually messed up the order and glitter should have been Tuesday, but oh well! When I think of New Year's Eve, I think of GLITTER. And since I live in NYC, I think of the Times Square ball that drops and is covered in crystals (Waterford, not Swarovski)! Quick NOTD here. I've been meaning to share this for a while but kept forgetting and I want to clear out my posts before 2018! My friend went to Indie Shop in San Francisco and grabbed this pretty for me. I was having a meh to art day, so I grabbed this to put on. I like a quick NOTD sometimes and this one sure is pretty! Hello all! How are you recuperating from the holidays? I had posts ready but decided to take two days off from the blog. I'm behind on the nail art challenge, so I'll post both of them tomorrow. But, I do have a post full of glitter, which is tomorrow's prompt, so this connects! Merry Christmas Eve everyone! I'm squeezing in this post while some cookies are cooling because this is my current mani, and the one that I'll be wearing for the next days. I love how it came out! I did my entire manicure with this pattern! I was really feeling my Halloween Charlie Brown nail art so I felt I needed to do Charlie Brown for Christmas too! So I got into my winter vibes and created a scene from the movie. This was also on last night, and I watched it right before I went to Rockefeller Center to take an annual photo with my boyfriend. We have been going every year since 2009! Gifts! I'm either really good at them or really bad. I'm bad this year. Whomp. I have some more to buy. I debated what to do for this prompt! I have so many cute holiday wrapping paper, which I was going to do. Then I decided to create a wrapping paper I want! You guys!!!! 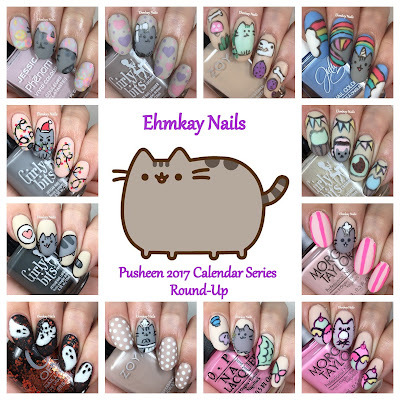 It's the last of the Pusheen Calendar Series! 12 months of Pusheen. I already have the 2018 calendar, so let me know if you think I should continue this! I probably will because these were simply fun. December is the month for holidays, and Pusheen is giving us a few gifts! Ugly sweaters are all the rage, right? They are so ironically hideous, that they are cool. LOL. Of course we had to include this in our prompt! I've done all sorts of ugly sweater nails over the years. In fact, mine was so hideous, that I had to redo them LOL. But goodie for you, I've added them at the end of the post. As Chanukah winds down, I wanted to share just one more manicure with you! My friend was posting all sorts of awesome plaid manis and I had already planned a red and green one and said, hey! Why not a blue and gold themed one? I had the perfect Beauty Big Plate that I was saving to use for a manicure this week, so I pulled it out for double duty! Hello all! I hope you've enjoyed your weekend! I'm about to head out and do some fun things around the city, but I wanted to pop up this post! 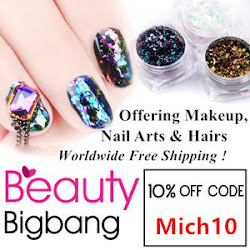 I received this plate from Beauty Big Bang just a few days ago so I wanted to throw up a post before the holidays. I ordered this hoping to use the lights image for the light prompt, but didn't receive it in time. But luckily, there's always next year! Tonight is the fourth night of Chanukah and I have a few more nail arts. It gets harder and harder to create designs, but also, Chanukah fell right on my finals. If you're a professor, you know that it's just as stressful for you as it is for the students. So today, I have a more simple design. Yes. This is a super late post. At 9pm, I finally got my act together and started to do my nails LOL. I am under a pile of grading, so I didn't get a chance to change my nails the last few days. SADNESS. Anyway, the grading is almost over. I technically got this post up by midnight. So win, win? Day 4 of the challenge. Let's get to it! Good evening! Yesterday, I shared a Chanukah manicure featuring a few polishes from the Lechat Moon Goddess collection. Today, I have individual swatches. I'm loving the ethereal holiday collection. The color palette is really soothing and a nice departure from the typical shimmery reds. Hello Tuesday and Hello Chanukah tonight! Today continues the Winter Nail Art challenge with Polished Lifting, and today's prompt is lights. What better way to kick off the Festival of Lights, Chanukah, than with menorah nail art? With the holidays around the corner, I have a few more collections to share with you. Today, I'm sharing the mini gift set which includes 5 ultra minis in a clear plastic tube. These are super minis, so I'm holding a bottle of their base coat to show them off. Let's get to the details. Hi all! Today I'm showing you Jessica Cosmetics Phenom Red Beryl. This is one of three gift sets that is for the holidays (the other colors are a red shimmer and a shimmer top coat, but I don't have them). It comes with a Jessica base coat and the Phenom shine top coat. Good morning! Before we head into the weekend, I wanted to share some comparisons of the newest Zoya Party Girls collection! I know that some of the colors looked familiar, so I felt I had to share them with you! 9/12 of the colors seemed to look like other colors, LOL. SO sit back and share your thoughts on these colors with me. Good evening! I'm here with a later post because this is my first post from my new computer. I'm very anti-new electronics and dragged my feet to get a new one, but I had no choice. I feel like there's always a learning curve even though it's not new technology by any means, lol. This one feels weird. Maybe because it works? If you have the midweek blues, fear no more, because today I have the Zoya Party Girls collection. This holiday is a nice collection of cremes and shimmers, and will definitely be a hit with purple, red, and pink lovers. 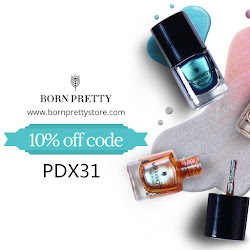 There's 12 polishes, so let's jump in! Today kicks off the Winter Nail Art Challenge that I am hosting with Polished Lifting! I had so much fun with the Halloween Challenge I created, that I teamed up with a fellow blogger. Please, join us in some of these prompts, as we celebrate winter! We are kicking this challenge off with Winter Wonderland, and the background of our challenge inspired my art! Hello there! As promised, I have comparisons of the newest KBShimmer collection! If you are an avid KBShimmer collector, you may have thought some of these colors look familiar. So I combed through my stash, and while I don't have every KBShimmer, I was able to provide you with some comparisons. Happy weekend! How has your been so far? I woke up way too early today to hit up Bath and Body Works once a year candle sale. That's always a fun time haha. I got what I wanted before the massive crowds. Tomorrow, I'm going to be holiday-ifying my home because I've been so busy with life and my work schedule. Anyway, without further ado, I have the new KBShimmer Holo-Day collection today. Of course, with the word holo in the title, you know I had to get some sun shots. So sit back and be ready for some rainbow goodness. Yesterday was the end of fall for me and today, we jump RIGHT into holiday collections! Today, I have the holiday gift set from Morgan Taylor from their Little Miss Nutcracker collection!